How to Change Page Orientation of a Spreadsheet in Microsoft Excel 2013? This article will explain how to change the page orientation of the excel worksheet in Microsoft Excel 2013. There are times when the worksheet might be wider because of the amount of data being captured and hence one might feel to switch to the landscape mode from portrait so that the printout of the worksheet might look better. Follow the below steps to change orientation of a spreadsheet in Microsoft Excel 2013. 1. Launch Microsoft Excel 2013 and open the excel workbook that you want the orientation to be changed to landscape. 2. In the Page Layout tab of the Excel 2013 Ribbon, Identify the Orientation dropdown button under the “Page Setup” group. This will display 2 options for the user to select. First one is the Portrait mode which is the default mode and the second option is the Landscape. 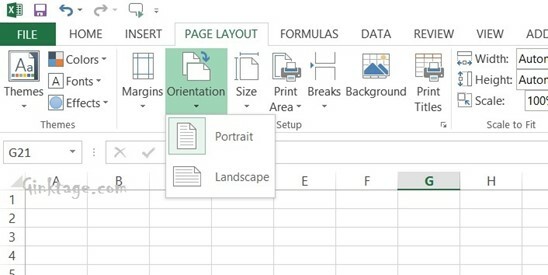 Select “Landscape” and save the Excel sheet to change the orientation to landscape mode.